And all the attention is on Psl's while everyone continues to pay $8 or more for a beer, $20-50 parking and $70+ for a game ticket! Sounded too me there is more than just those 1% er's filling up the stadium that have the money to spend NOW. Probably $125 -$200 a person spent over a 3 hour game that's not chump change in my books! Everyone of these items and more are going up in cost as well (can't have a high cost stadium without higher prices to go with it). 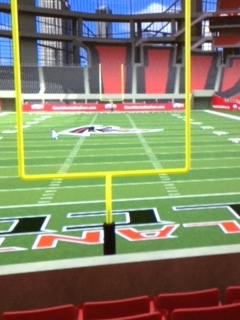 I go to ALL sporting events in the ATL, BUT the Atlanta Falcons are the ONLY one's I have season tickets for! I CARE LESS of having season tickets to 80 Braves games or 40 Hawks games and I get good or great tickets to the games I attend ( no worries or thoughts of having the same seat for each game)I can care less. MY 23 yr season tix to the Birdz may come to individual seats real soon but, not giving up yet. For all that's bashing the ones that are buying - why ya'll being haters? Do I work for the psl sales team too..lol , too funny. I wish everything stayed the same price too, but it isn't . The only thing that is staying the same is my pay. Cars and houses are going up and I cant afford to buy a new one and not trying to keep up with the JONES either. Lets all go to the gas companies, car makers, job owners and lets tell they what they can and cant do , that we live and America and we are all not taking it! right lol If you can't afford PSL's thats the least of your problems and mine too. There no since crying over it .Go watch the kids movie Frozen... and let it go !! If anyone here gets were they can control the cost of items in America you have my vote. And I am 120% against PSL's myself I do not have to get them and probably want depending on what my none club section will cost. I definitely would not have them if I sat in the club sections. Just last year I was in the same type of situation when the Chickfila Bowl moved to part of the playoff system bowls. I had 11 tickets for 12 years . The tickets were $90 each row 4 sec. 138. But when this change happened they moved my sitting section to the corning of the endzone row 28 AND the new price per ticket was $210 each. Loyality yeah right not in this time or error. Guess what I did, Walked away from it and don't give a dame about it any more. I can still go to the Chickfila Bowl any time I want . I'm not stupid and made the best choice according to my OWN situation and I can live with that! Everyone on here can continue to agree to disagree and that fine. But the only control you have is your own actions. If your as passionate as you say you are ..then I don't see why you wouldn't put your money were your mouth is!! If you were ALL IN on football just maybe you would give up your leisure activities and so on for the right to see all games from the same seat. I haven't seen anyone pull your teeth in any decision making calls. There are options of how to view games : at home, individual games , seasons tickets best seats in the house , season tickets not best seats in the house or none of the above. Your choice. PSL's are not for everyone (( the DOC has been saying that from day one)). He may have sounded arrogant from the beginning but I do respect his decision making. Guess he's ALL IN. I a 23 yr. STH have not made that choice yet but I do say family & finances before FOOTBALL any day of the week , Rise Up from your wallet or Rise Up out of your seat !!! Again by NO means am I for psl's but I would think the Falcons will not lower the psl's prices any time soon for one it would cause a conflict with the one's paying the higher prices. I would guess they would stick to selling individual seats until they had a taker on psl's ( I think it would be years down the road before they discounted psl's). By them selling individual tickets in my section say at $110-120 a game were as me a season ticket holder get them for $88-96 they would get more revenue until seat license are sold and still make psl cost. Yes they most likely will go down if not sold, BUT we do not know for sure. It's totally up to the individual buyers and the Falcons winning. A cat and mouse game if you must. Season ticket holders are not worms, everyone including myself have opinions! We have that right to voice our opinion BUT it doens't mean we are going to change a thing. The majority have always ruled!!! You, I , them can all wait to see if everyone else pays PSL's (hoping and wishing NOT) but it's not in our control. If NO ONE pays just maybe the pricing falls or goes away , good for the waiter.But if not take the chance and get the worst seat or watch at home(the game of chance..(life)). EX. If I was to say I WOULD NEVER PAY $8 FOR A BEER AT A SPORTING EVENT AND EITHER SHOULD NOONE ELSE I guess I wouldn't be drinking ever again at a game while everyone else does LIFE does go on with or with you. I'm not jabbing this at you personally just saying in reality. I enjoy going to the games live and think they show cut out the cost of the ((joking )) preseason games and that would be a 20% savings ... a start! The whole tread is a touchy subject with alot of different opinions! Unfortunantly the mighty (($)) is about greed as the rich get richer and the poorer are suffering. PSL's are not going away like it or not! Especially that our 1.3 billion dollar stadium and growing cost is not all funded through taxes or by the NFL, has to be paid for one way or ANOTHER. There is no loyality In sports, work , or friendship these days . It sux to think the long time fan is getting punished (including myself) for PSL cost, but you can take it or leave it..and i'm one on the fence. I totally understand every side , the ones with money, ones without money and then the ones that may have the money but spite the reason of charging psl's are not paying.To me its no different than a theatre charging $8 for popcorn and $6 for a drink and at football games $8 a beer, WE can all complain about the cost BUT a heck of alot of people are paying it each and every game no matter what the cost. (( am I right.)) !!! I will leave with this ...the $45000 seats are NOT for everyone and I'm not in them myself, they do have lower and alot lower seating cost through out the stadium., fortunately I have enjoy my endzone seats for 23 years and hope the price is right if not hasta la vista!! I do think 45,000 is a bit high especially with the tickets doubling in price too!! Again my opinion...I'm not for it, but we'll see if theres more payers than none payers. Jb, the owners have Goodell, the players have a union, sounds like you could lead up the season ticket holder!! !